Supermarket News (SN) is the brand food-retail professionals count on for the competitive intelligence, news, and information to make smart business decisions. In addition to being the news and trends leader, providing next-level data and information is a pillar of SN’s content positioning. With exclusive rankings (Top 75 Retailers, Top 10 Online Retailers), as well as primary research reports (Whole Health, Center Store, Fresh Foods), SN is the most trusted destination for accurate and actionable information. Integrated programs that deliver results. 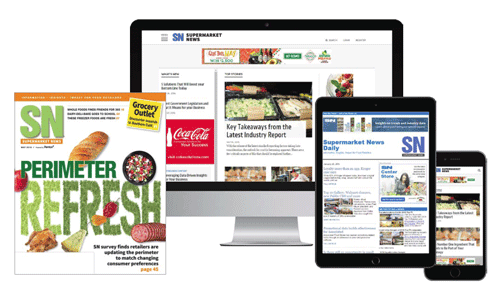 Supermarket News offers the largest audience in food-retail. The expansiveness of the audience not only provides widespread scale, but also a critical mass for more targeted promotions based on demographics or topical interests. SN also delivers the most ways to reach this audience, whether it be through the magazine, website, eNewsletters, mobile or live events. From tactical lead generation and product announcements to broad, strategic brand building and though leadership, more advertisers turn to SN to help deliver their marketing message.